The Holy Great Martyr George is known and celebrated throughout much of the world, and has been so honored since he bravely died for Christ and was restored to die again, finally being beheaded by the orders of the Roman Emperor Diocletian in a.d. 303. St. George was born in Cappadocia, and his father suffered there as a martyr. Soon afterwards his mother returned with him to Palestine. There he grew into manhood and entered the Roman military, rising to the high rank of tribune at the age of 20. When Diocletian began in earnest a new persecution of Christians in a.d. 303, St. George boldly came before him and confessed his faith in Christ, for which he was terribly tortured. He prayed before a large crowd, who were amazed by his restorations to health immediately after such torture. His prayers reached God and a dead man was resurrected before them. Many confessed Christ because of this miracle, including the Emperor’s wife Alexandra, who died on the scaffold shortly after. St. George saved a young boy whose mother prayed for his help. 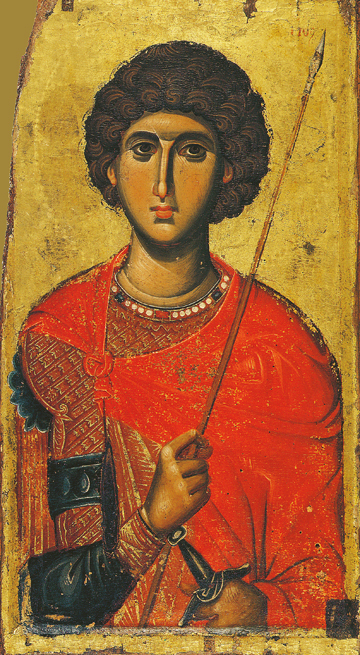 St. George is shown in this icon from Mount Athos in his bright military attire.